Enjoy the beautiful season of Fall in Cattaraugus County and watch the leaves change color in some of our most impressive spots! We are in line for an early but warm fall. So here are your MUST SEE Fall Foliage Destinations in the beautiful Enchanted Mountains!! The Enchanted Mountains roads will lead to views of hills and valleys covered by glorious miles of treetops, perfect for capturing the fall colors! While other places boast that they are the best, a drive on the 86 from Randolph to Portville will show that we have much to offer! Shown in photo is view from Pfeiffer Nature Center. 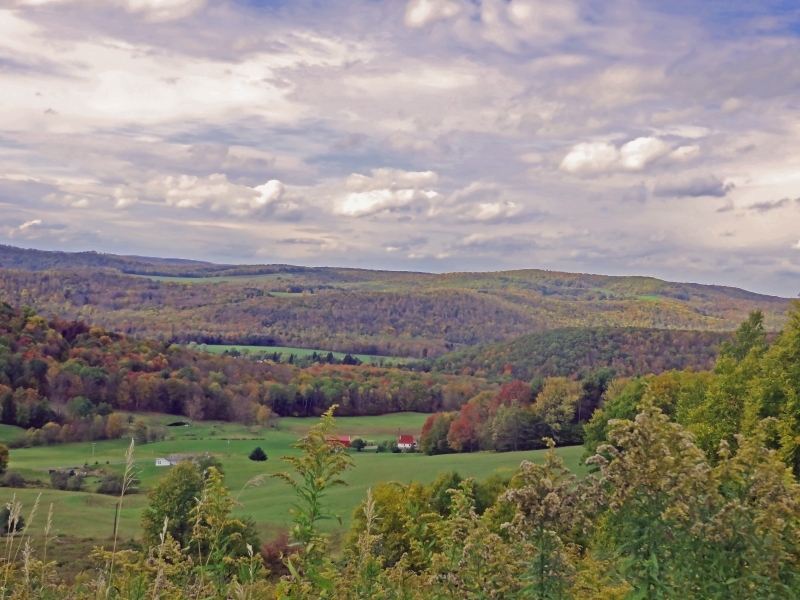 Hike along 80 miles of the Finger Lakes Trail in Cattaraugus County! Enjoy the crunch crunch of leaves as you enjoy breathtaking woods all around you! Explore the gigantic rocks while climbing to a view above the treetops, then hiking the trail through the fallen leaves. View the Rock City Park photo gallery. While you're at Rock City, look for the pull over on the way back to Olean on Rt. 16. You will spectacular, above-the-tree-top views from here as well! See the sculptures bask in the golden sun, the steel seemingly brightened by the color surrounding them. Venture through the woods to find hidden sculptures or look out over the countryside from the top of the "Castle". View photos of Griffis Sculpture Park. Coords: 42.238560, -78.980254. In the heart of Amish Country and a 360 degree view of the changing landscape. Sprague's Maple Farm and Restaurant offers visitors to hike their trails to see the fall foliage, looking for the sugarhouse, teepee, and maple lines running through the trees as they go along. Weekends in October they also offer free wagon rides up to the sugarhouse for warm mulled cider and maple cake donuts! View photos of Sprague's Maple Farms. There's a reason why they book up early for the Fall season. Families and friends have made it a yearly tradition to camp here to take in Autumn beauty, riding their bikes over the leaves, getting beautiful photos on the reflection of the lakes, or sitting by the campfire on the cool fall nights! View fall photos of Allegany State Park. We have 18 State Forests, Two Wildlife Management Areas, two Multiple Use Area and one State Park. That should be enough spots alone for your leaf peepin' adventures. See the DEC website for information on each. Scroll down to Cattaraugus County. Really experience the leaves as you climb through them! Find your way through the color as you venture over, around and on different obstacles. This multi-purpose paved trail along the Allegheny River offers a smooth path and just as many changes to see nature up close! This trail surrounds the City of Olean and the Village of Allegany. Watch the fallen leaves float lazily down the Catt Creek as you hike alongside. Plan a picnic lunch or get in the last of the fall fishing! The beautiful backdrop of trees full with color may distract you somewhat from your game, but this is a great way to be outdoors, active and enjoying our late summer, early Autumn weather! This is the perfect fall hiking spot with over 13 combined miles of trails. View the sunset from one of the best spots in the County at their American Chestnut Log Cabin. View photos from Pfeiffer Nature Center. This 12 mile trail that is used for hiking, biking, horseback riding or snowmobiling, offers plenty of sections under tree cover, areas of sunshine skies, walks over old railroad bridges and fall wildflowers galore! One of the best places to see the leaves, but a place you may not think of, is the Amish Trail along the Western side of the County. Follow the back roads over the hills to see fields of hay being gathered. Stop at the shops for goodies and gifts! Photos from along the Amish Trail. An arboretum is a sanctuary for trees, so you know you will be in luck here! The unique trees coupled with fall favorites like the Oak tree are sure to give you your fill of fall fun and it's conveniently located in Ellicottville! So if you're looking for amazing fall views, look no further than the Enchanted Mountains! Please comment on which place is your favorite or where you go to spot is for leaf colors!